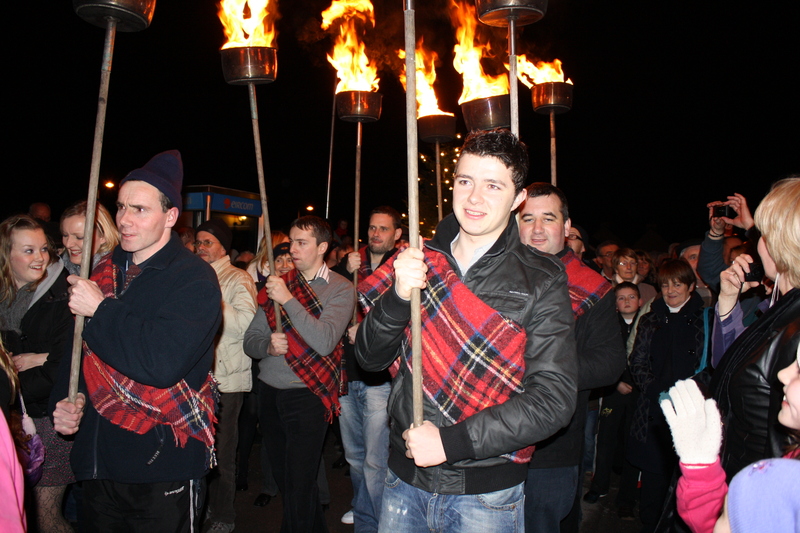 For over a century and a half, the arrival of each new year is celebrated in Portmagee with a unique custom called ‘The Old Year’. It’s a little bit crazy, a little bit amazing and a fantastic time. The year was 1727 when, three days after Christmas, a Kinsale brig, flying a French flag, landed in the Port of Portmagee after coming from Nantes France. The boat’s mission was a cargo that was, let’s say, not in the interest of the British taxpayer, as smuggling on this coast was a familiar feature. The boat remained until the New Year but what was to happen the people of Portmagee on New Year’s Eve 1727 was to going to change their little village for evermore. As the locals were retiring for the night, a strange but eerie noise was coming from the vicinity of the local pier. Many thought it was the banshee (a female spirit whose wailing is said to warn the hearer of an impending death in the family) as the strange sound came up towards the village. To the locals amazement they saw the crew of the French boat holding torches and marching through the village. They were led by a piper and in the centre of the torchmen a shaggy and staggering figure of an old man on his last legs was swaying as if his time was up. They proceeded through the village making a racket and when they returned to the head of the pier a shot rang out and the old man lay on the road as if dead. Silence descended again but only for a moment when a newly-dressed man with white trousers, swallow-tail coat and top hat emerged from the darkness and he repeated the route of the old man with again the piper leading him and the torches either side. The new man gave a speech to explain to locals about what they had just seen and he went onto inform them that the old man had symbolized the year gone by and, come midnight, he was no more. The New Man symbolised all that was new and the youth of the year that had just begun. For New Year’s Eve – Ger O’Shea is playing in the bar from 9-11pm and afterwards there is a disco by Tommy Gilligan.